Another day another pho place. This is a place that opened in downtown Mountain View since we last lived here. We were there specifically for a scouting mission, since they have a challenge that Jonathan and our friend Andy (not Florida-Andy) want to do. It's a giant bowl of pho, which (for our newer readers) is a Vietnamese soup. 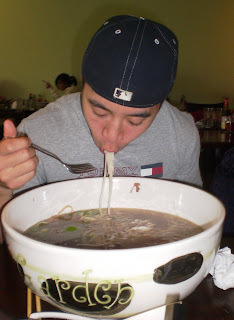 So this time, Jonathan and Andy both got the XL (the challenge uses a 3XL) pho and timed themselves on that. They weren't really eating it for the flavor (Jonathan did not spend nearly his usual amount of time seasoning, LoL), but they seemed to like it well enough. I, on the other hand, went for the Spicy Chicken with Garlic Noodles. I thought this would be pho as well, but it turned out to be a broth-free dish. The chicken was plentiful, but the skin was still on it, so it took a bit of work to separate that. 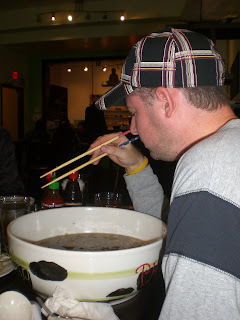 The noodles were heavy on the garlic, but that was to be expected. Cucumber and tomato garnished the dish, but didn't really add anything. I added a bunch of lime (having mistakenly ordered "extra lime" since I thought I was being served a pho), which gave the spicy chicken a great flavor, so I'm glad I did. In investigating the challenge, we had found out that you were permitted to remove two of the six or so kinda of meat that was in the gigantic bowl. So, Jonathan and Andy both chose to remove the tendon and the tripe, since those are harder to get down (strange textures and such). However, when the bowls came out, those meats were present. They were promptly sent back. BUT, instead of bringing out completely new bowls of pho, they apparently just tried to remove those meats and added more of others instead. Well, this failed miserably because there was some tendon and a fair bit of tripe that remained in the bowl. PLUS, the time elapsed allowed the noodles to expand quite a bit, which removed the strategy of gobbling down those first. About twenty minutes in, they knew it was a bit of a stretch to attempt to finish off the challenge, so the pace slowed quite a bit. Andy had more optimism than Jonathan about it, and he continued to wolf it down for another ten or fifteen minutes, until he also knew that their efforts were fruitless. They did receive t-shirts for attempting the feat, and I took notes from each of them as to how they'd approach it next time, LoL.